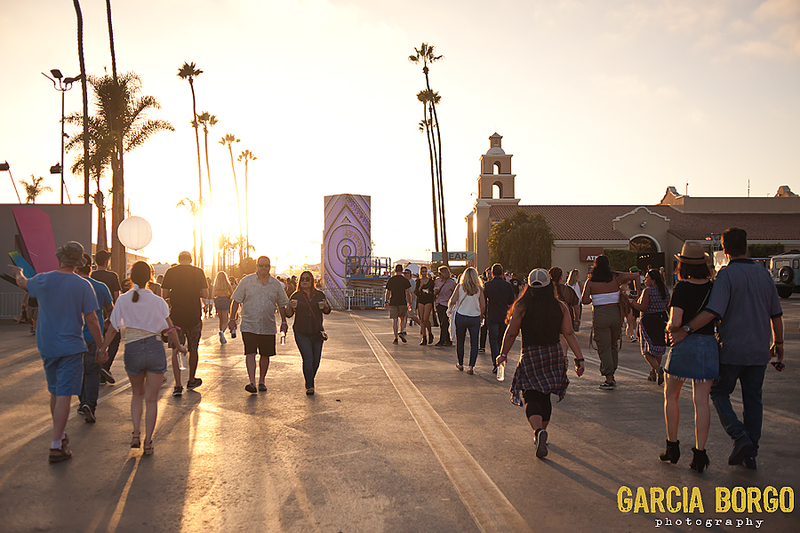 KAABOO Del Mar‘s stated mission is to entertain, educate, and evolve, and this year’s festival checked all three boxes. The lineup, ranging from rock legends Foo Fighters to this year’s hot goodness Post Malone, had something for everyone, as proved by the demographically diverse crowd. Now in its fourth year, KAABOO Music Festival has the industry credibility to bring in the heavy hitters, and they did. The Foo Fighters and Post Malone both drew huge crowds on Friday evening, each giving all in attendance a performance worthy of a headliner. Foo’s frontman Dave Grohl chuckled at the train rolling by, breaking in to a blues performance to accompany the locomotive going down the tracks, while Taylor Hawkins played his Soundgarden drumset on a twenty-foot riser. A sober Post Malone ran through his hits to an adoring crowd on the other side of the racetrack to close down Friday night. Earlier in the day, highlights included alt-rockers Jimmy Eat World in a set that drew both a large audience and crew members from other bands. Veteran band Better than Ezra played a set on the Trestles stage to open up most of the action on Saturday, playing to a large group of dedicated fans. The New Orleans rockers were acutely self-aware, joking with the crowd about their age and place in rock history, all while ending the set on a drum solo consisting of five different sets of cowbells. The Wailers played a set that included 4:20 in the afternoon, resulting on a smoke cloud visible from halfway across the festival. The comedy lineup also hit full swing, with Orny Adams, Louie Anderson, Whitney Cummings, and Craig Robinson all filling the large Humor Me tent throughout the day. Before Imagine Dragons closed down the day with a set attended by what seemed like 80% of the sold-out crowd, Cake played a packed side stage with their trademark banter/complaining and 90s/00s flair, while N.E.R.D dazzled the main stage. Across the way, legend Billy Idol worked his way through the hits, entertaining both young and old. While I was skeptical about how Imagine Dragons’ arena rock would play in the open air and to a mixed crowd, the band absolutely crushed it, and any accolades are well-deserved; frontman Dan Reynolds is talented as hell, and plays the crowd expertly. Sunday’s big draws were Katy Perry and Robert Plant, both of whom delivered legendary, crowd-pleasing sets to close down the weekend. Earlier, TLC (RIP, Left-Eye), Slash, and Wiz Khalifa drew large crowds on the somewhat quieter day, while the art and food tents seemed to see more traffic than the days prior. San Diego’s own Jewel closed down the Trestles stage – easily the most intimate and most popular place to see the non-headliners. Katy Perry put on a spectacle of a show (see the pics below) while Robert Plant delivered a classic rock show, playing Led Zeppelin songs for a third of the set while playing experimental originals for the remainder. This year’s edition of KAABOO Music Festival upped the ante, with considerably more interactive options. In addition to the amazing food and art, most vendors expanded their offerings. Blue Moon offered screen printed bandanas, while Monkey Shoulder brought their concrete truck mixer. Hendricks Gin again had their hot air balloon taking passengers up for a view, and an activation over by the main stage. An e-sports platform could be found near the VIP lounges, and a one-wheeled skateboard track allowed people to attempt to be their best racer. Overall, the increased crowd filled the thoroughfares, but the stages were still appropriately roomy for a packed festival. The festival utilized the same set up as last year, putting the two main stages about half a mile apart, leaving plenty of room in the middle to take in the sights and sounds, and keeping traffic moving. Early Bird tickets for next year’s KAABOO Music Festival are already on sale – early rumblings at the festival had Pearl Jam pegged, but let’s be clear, that’s total and complete speculation – if you want to get in on next year’s fun!